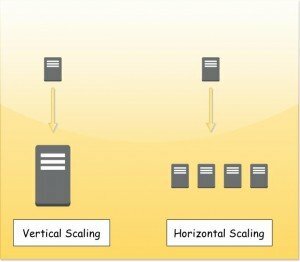 Vertical Scaling - Vertical scaling is also known as scaling up. Vertical scaling refers to adding more resource to a single node i.e. adding in additional CPU, RAM and Disk to enable a single node to handle a growing workload. Vertical scaling has a number of limitations the most obvious one being outgrowing the largest available system. Vertical scaling is also more expensive as your grow. Cost wise scaling vertically is not linear. Horizontal Scaling - Horizontal scaling is sometimes referred to as scale out. Horizontal scaling is adding capacity by increasing the number of machines/nodes to a system so that each node can share the processing. Horizontal scaling is a cheaper and more flexible option. This flexibility does come with a cost. Sharing processing and storage amongst an army of nodes is complex. Shared Memory i.e. Traditional Deployment Architecture - Shared memory is the standard traditional hardware architecture used by database systems. This architecture is characterised by having a number of cores sharing a block of RAM via a common cache and memory bus. Scaling using this approach (vertical scaling) is essentially buying bigger and better hardware i.e you scale by adding more CPU, RAM to your existing machine. Highly parallel shared memory machines are one of the cash cows of the hardware industry. Traditionally RDBMS database have been designed and worked well on shared memory architecture. Shared Disk - A shared disk approach is characterised by a number of independent nodes which have their own RAM and CPU but share a common disk. Shared disk file systems use Storage Area Network (SAN) to provide direct disk access from multiple computers at a block level. The Shared Disk architecture has gained traction with the rise in popularity of a Storage Area Networks (SAN). Popular RDBMS such as Oracle and MS SQL use a shared disk architecture in order to scale horizontally. Shared Nothing - A shared nothing architecture is characterized by having a cluster of independent machines communicating over a high speed network. There is no way of accessing memory or disk of another system. It is up to the database implementor to coordinate efficiently among various machines. Each part of a cluster stores a portion of the data and thus data storage is spread across the cluster. The main advantage of this approach is the ability to scale. Shared nothing architectures are scalable linearly because there is no single bottleneck in the architecture and have been proven to scale linearly. Atomicity - All or nothing i.e. within a transaction (A transaction is a logical unit of work or a group of related changes) either the entire logical unit of related changes are performed or none of them take effect. Consistency - Ensures that all data written to a database will always be valid according all rules defined in the database. No database rules or constraints will ever be violated when a transaction is executed. Isolation - Must make sure that no transaction has access to data as a result of an unfinished or currently processed transaction. Each transaction is independent and is not affected by other transactions. Of the four ACID properties the isolation property is the most configurable and often the most relaxed. The ANSI/ISO SQL standard defines a number isolation levels which are implemented by most DBMS. These include Serializable, Repeatable reads, Read committed, Read uncommitted. A detailed discussion on isolation level is beyond the scope of this post. Durability - Ensures that the results on a transactions are stored permanently once the transaction has been completed. Consistency - A guarantee that every node in a distributed cluster will return the most recent write i.e. every node will return the same data. Availability - Every non failing node returns a response in a reasonable amount of time. Partition Tolerance - The system will continue to function inspite of network partitions. NoSQL database refer to a group of databases that do not follow the traditional relational data model. Google and Amazon were one of the first companies required to store large amounts of data. They essentially found that storing data in a relational database did not allow them to store the vast amount of data in a cost effective manner. They pursued alternative approaches successfully and published their findings in seminal papers Bigtable: A Distributed Storage System for Structured Data and Dynamo: Amazon's Highly Available Key-value Store respectively. It is rumoured that Jeff Bezos was livid with the publication of Amazon’s paper as he believed that it gave away too much of Amazon’s secret sauce. Although there were a number of NoSQL database prior to the publication of these papers the the NoSQL (Not Only SQL) movement gained popularity and a number of new open source and commercial NoSQL were inspired by these papers. NoSQL database have grown in popularity due to their ability to scale horizontally and handle unstructured and semi structured data efficiently. Based on distributed computing - Unlike traditional RDBMS, NoSQL database have been designed to favour distributed computing and a shared nothing architecture. This is essentially because scaling horizontally is believed to be the only cost effective way of handling large volumes of data. Additionally horizontally scaled databased is a simpler way to handle large workloads. Commodity Hardware - Most NoSQL database have been designed to run on cheap commodity hardware (in reality high end commodity hardware) instead to high end servers. This has mainly been done in order to enable scaling in a cost effective manner. ACID, BASE and the CAP Theorem - NoSQL database have traded one or more of the ACID (atomicity, consistency, isolation and durability) properties for BASE properties (Basic Availability, Soft-state, Eventual consistency). As all new NoSQL databases use distributed computing and due to the limitations placed by the CAP theorem NoSQL database have chosen BASE (Basic Availability, Soft-state, Eventual consistency) over ACID. While ACID is a pessimistic approach and forces consistency at the end of each transaction, BASE is an optimistic approach where by it accepts that data will be in a state of flux but will eventually sort itself out. Choosing BASE over ACID enables systems to scale horizontally (This might not be entirely true with the advent of NewSQL databases). The definition of the BASE properties follow. Provide a flexible schema - In order to store the large growing amount of semi structured and unstructured data developers need a flexible solution that easily accommodates different types of data. Additionally due to the constant change in requirements a schema which is easily evolvable is also required. Thus most new NoSQL database generally provide a flexible schema which can be easily evolved as opposed to the rigid schemas required by RDBMS. This has made working with semi structured and unstructured data a lot easier. Key-Value databases - Key value stores provide a simple form of storage that can only store pairs of keys and values. Values stored are essentially blobs and can be retrieved based on keys provided. Some key values stores persist data to disk while others such as Memcached keeps data in memory only. Riak, Redis, Amazon Dynamo DB, FoundationDB, MemcacheDB, and Aerospike are examples of popular key value stores. Column Family Databases - Column family based (not to be be confused with column oriented) database are again an evolution of the key value store where the value part contains a collection of columns. Each row in a column family has a key and associates an arbitrary number columns with it. This is useful for accessing related data together. Popular column family based databased include Apache Cassandra, HBASE and Hypertable. Graph Databases - A graph database is one which uses a graph structure to store data. Graph database enable you to store entities and establish relationships between these entities. Distributed Storage System - Databases in a nutshell are have two main tasks storage and computation. Distributed systems accomplish the two main tasks by using an army of nodes instead of a single node as the problem no longer can be solved by a single node. Cassandra runs on a cluster of nodes using a shared nothing architecture as it is designed to store a huge amounts of data. Runs on Commodity Hardware - Like most distributed systems Apache Cassandra has been designed to run on commodity hardware. This enables Cassandra to scale in a cost effective manner. Fault Tolerant - When running an application on a cluster of nodes network, hardware and system failures are a reality. Cassandra has been designed from the ground up to work in an acceptable manner in spite of faults in the system. Linearly Scalable - Cassandra is linearly scalable i.e. doubling the number of nodes in your cluster doubles the performace. This linear scalability has enabled Cassandra to handle terabytes of data and thousands of concurrent operations per second. Netflix has done a benchmark where it is shown that Cassandra scales linearly and is able to perform one million writes per second. AID Support - Cassandra delivers atomicity, isolation and durability but this is not within the bounds of a transaction. Apache Cassandra does not support the traditional RDBMS concept of a transaction. It does support AID within the bounds of a single operation. Elastically Scalable - Apache Cassandra is able to elastically scale i.e. it is able to cope with growing/shrinking loads dynamically. It is able to expand and shrink resources according to the workload. This is especially important when using cloud resources as cloud resources follow a pay-per-use model. Multi Data Center - Cassandra is architected so that it can be easily deployed across multiple data centres. Clusters can be configured for optimal geographical distribution so cater for redundancy, fail over and disaster recovery. In my next post I will explore Cassandra's architecture.